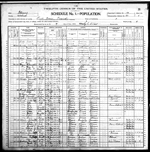 Searching for information to extend my data on my family history. Wade Couch (1861-1922) married Ella Skaggs (b.1866) Their daughter Hattie Couch was my grandmother and married Ernest Gray. Ernest's father was Wilson Gray, and his father was Daniel Parker Gray who married Lucy Crackel. Gray, Crackel, and Couch were frequent surnmes in Wabash, Edwards, and White counties of Illinois. Does anyone recognize these people? Can you extend my family history data?